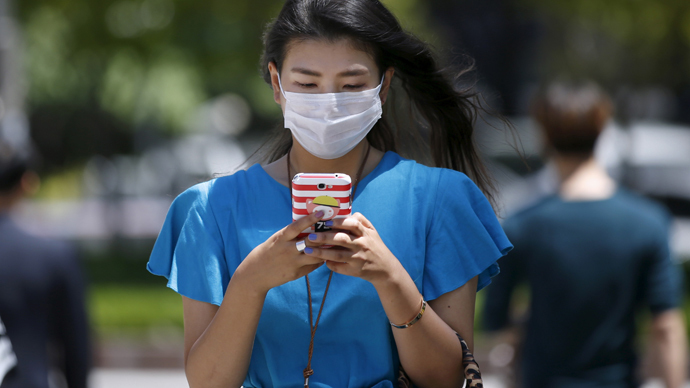 After a fifth person died of the Middle East Respiratory Syndrome (MERS) in South Korea authorities warned they will be tracking the cell phone signals of hundreds of people under quarantine to halt the spread of the disease. Acting Prime Minister Choi Kyung-hwan said the government will step up its monitoring of undiagnosed patients, currently quarantined at home, for fear they might have contracted the deadly virus too. It includes tracking their whereabouts through cell phone signals. "Please understand this is an unavoidable measure for the sake of our neighbors and families," Deputy Prime Minister Choi Kyung-hwan told a news briefing in the central city of Sejong, Reuters reports. Over 2,300 people are currently under quarantine, either in health care facilities or at their homes, including an entire village of 105 people in the southwest after a resident who visited a hospital where the country's first patient with MERS was treated turned out to be infected. Health experts say the virus, which has no vaccine, spreads through close contact with infected people, and not through the air. MERS, a respiratory disease that can lead to kidney failure and pneumonia, was first was first identified in 2012 in Saudi Arabia. Up to four out of every 10 MERS sufferers have died. Severe damage is caused to those with weakened immune systems - the elderly and those with chronic diseases such as diabetes and cancer. As many as 64 people in South Korea have been infected by the killer virus since last month in the largest outbreak outside the Middle East. According to the European Center for Disease Prevention and Control, South Korea has the highest number of confirmed MERS cases, after Saudi Arabia, United Arab Emirates and Jordan. More than 1,200 South Korean schools were closed at the end of last week, according to the Education Ministry. On Sunday, education authorities in Seoul and the neighboring Gyeonggi Province ordered more schools in their regions to close for the time being, AP reported. But officials say there's still “a chance at putting the outbreak under total control." "So far, all the MERS cases have been hospital-associated, and there has been no case of an infection in other social settings," Choi told a news conference on Sunday. The government has been under fire for a lack of transparency in tackling the outbreak, especially after health officials allowed an infected 44-year-old man to travel to China on a business trip, despite doctors’ warnings. The patient, who contracted the virus from his father, flew to Hong Kong before traveling on to the city of Huizhou in southeast China; he is currently under quarantine in the city. The South Korean man had tested positive for MERS last month, China's first confirmed case. On Sunday, South Korean authorities finally unveiled the names of 24 hospitals where MERS patients have been diagnosed or had been treated before their condition. This long-awaited move will allow those who have visited those facilities in recent weeks to report themselves in case they show any symptoms of MERS-related illnesses. Up to 7,000 people from China, Hong Kong and Taiwan have canceled trips to South Korea, according to a spokesman for the Korea Tourism Organization (KTO). "A mass cancellation on this scale is very unusual... and many travellers cited the MERS outbreak as the main reason," the KTO’s spokesman told AFP last week. On Wednesday, a MERS hotline launched by the government had to cope with 3,000 calls as public alarm escalated.